Inspiring Ideas with artist Jeanne Winters: Howdee, New Neighbors! Time to welcome more new neighbors into our 'hood... My daughter helped me bake chocolate chip cookies while my son napped. Ya know, she is such a good helper ... once she knew we were not giving away ALL of the cookies, that is!! We picked out a dozen of the "prettier" ones and tucked them into a big parchment paper envelope. I punched a hole in the top and held it closed with a curly ribbon and an enormous homemade "Welcome" tag. Added our names and phone number to the back and away we go! makes ~5 dozen; oven 375. In a separate bowl combine dry stuff: flour, salt & soda. Drop from teaspoon 2 inches apart onto ungreased cookie sheet. Fill a glass with cold milk & dig in! 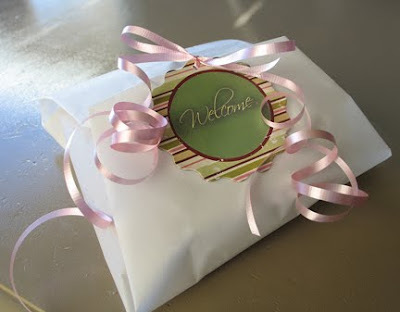 What a cute way to wrap a gift of cookies! A great thing for a neighbor to do. Thanks so much for stopping by today... and for making me hungry!!! What a lovely idea! And what a lovely gesture. I still don't know some of my neighbors so I probably shouldn't be handing out advice, haha. They look so ooey gooey I am drooling here!! YUM! I love the idea of a parchment envelope! Those look so yummy! And that's such a lovely way to welcome a new neighbor. I'll have to keep it in mind. Thanks again for inspiring me! We have new next-door neighbors who should be moving in shortly! Just wanted to say the same...a great idea...and such cute wrapping! 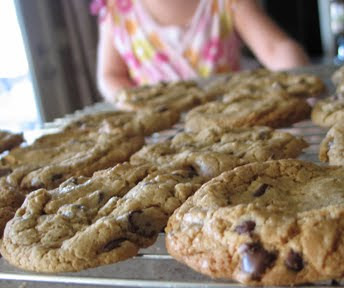 Ooooooh yum yum I want those cookies - I think I might make some today. A new neighbor just moved in this week and my 8 year old is begging to go over and bring them some goodies. I am totally stealing this idea!! !